This shawl, Moonlit Path, was a fun test knit for Lisa Hannes. Lisa designs the most beautiful shawls and I've always wanted to test knit for her. This test fit into my schedule and I had the yarn in my stash, so I jumped on board! The slipped stitches that form the mosaic pattern was rhythmic and hypnotic, and just a quick glance at the graph at the beginning of each right side row got me going on a long row of relaxed knitting. If you've wanted to try mosaic knitting, the simplest form of colorwork, then this would be a good one as it's about as easy as it gets. For all its simplicity it manages to create a striking design. 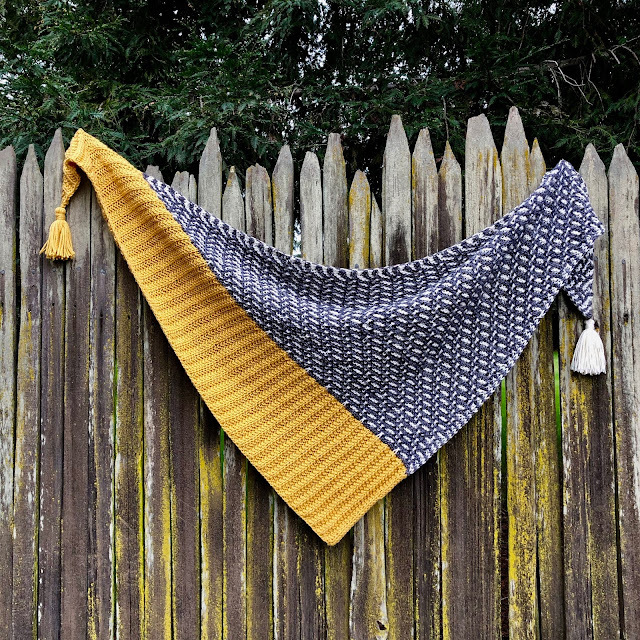 The size is easily customizable and I think it would be fabulous as a gigantic-sized shawl. Moonlit Path is out today. Lisa is offering it and ALL of her self published patterns for 25% off with the code HAPPY SPRING until Sunday, April 14th, end of day Berlin time. You can find all her patterns here. 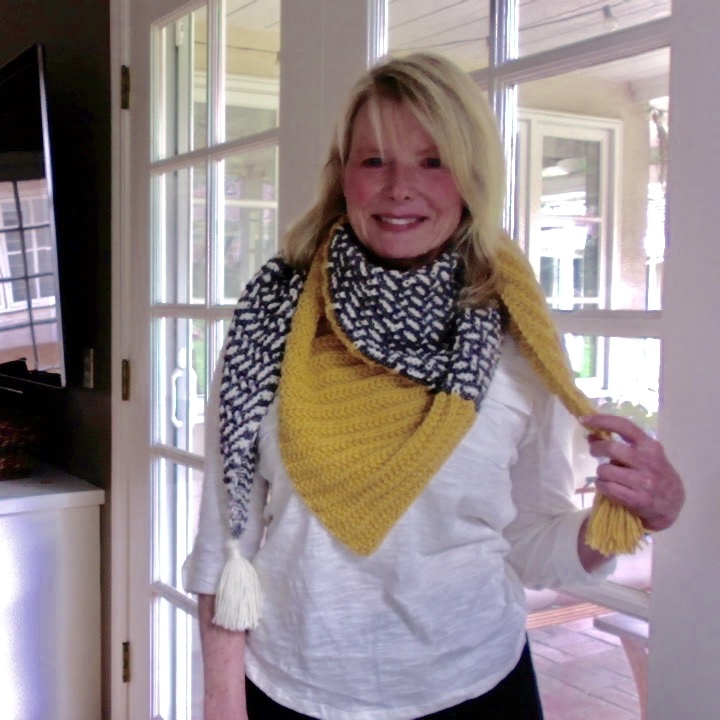 She is best known for her shawls using mosaic stitch for color and beautiful texture with clever stitch combinations. 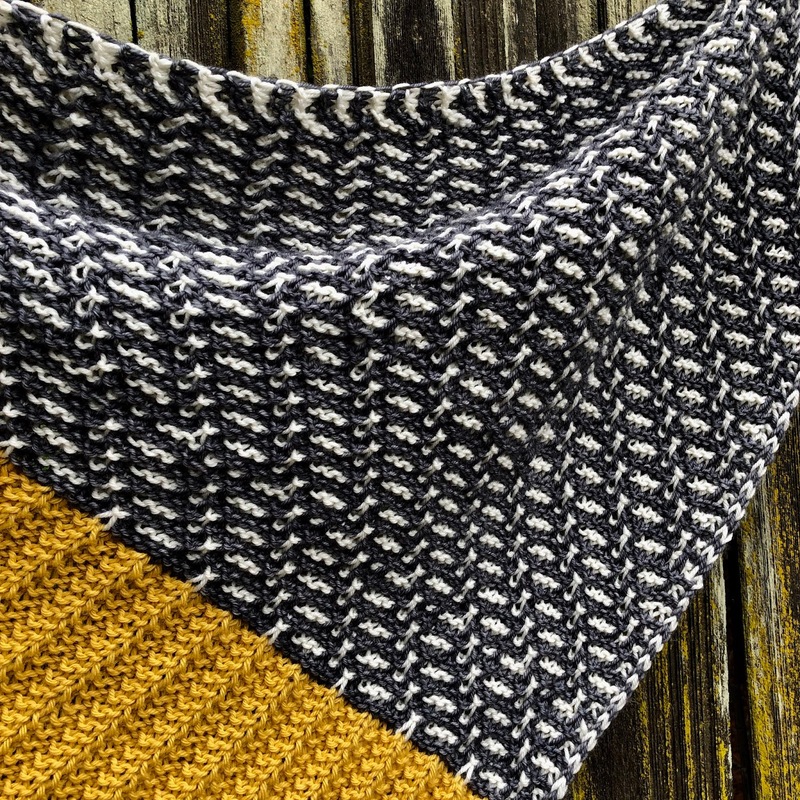 The yarn used was Shelridge Yarns Soft Touch, 100% merino wool, in natural and charcoal. That it was lovely to knit was no surprise to me at all. It has a beautiful twist and is supremely well-behaved. What was a surprise was how much I liked the Berroco Vintage, an equal blend of wool and acrylic. I usually turn away from such a high percentage of man-made fiber but this was from a yarn swap. 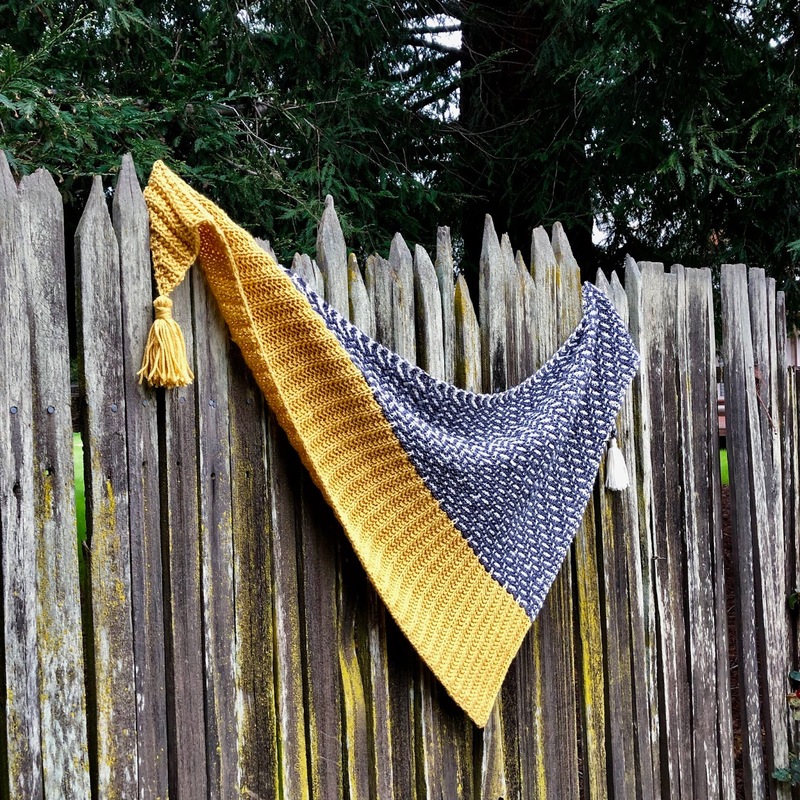 I have 4 skeins of this gorgeous yellow and used one for the shawl; the remaining three will soon be a sweater for my grandson. Vintage was cushy and soft and had no acrylic squeak. Before I give it a complete thumbs up I have to see how it wears. In the next few weeks I'll be sharing some garden posts and entertaining posts. We've had some great weather lately and we've been able to focus a lot of attention on the garden. It's shaping up really well although my back could use a rest! I've also got some FOs to share and planning some gorgeous summer projects with some new summer yarns. Spring is the best! 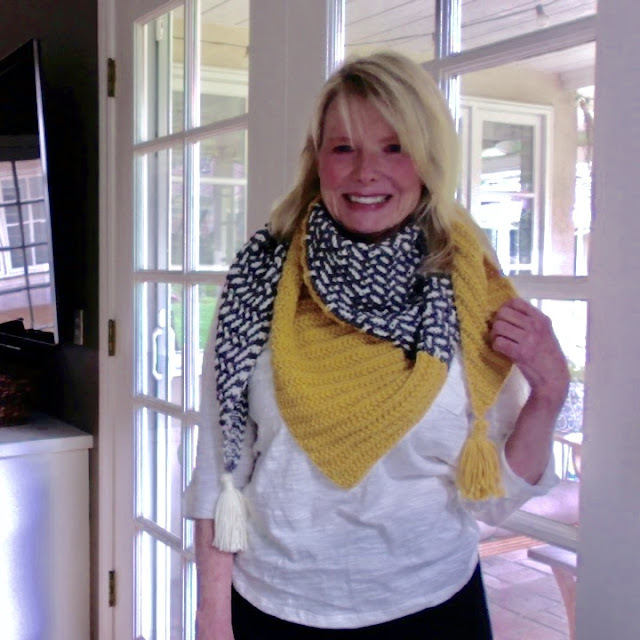 See all of Lisa's patterns here. To make a comment, scroll down or click here.